New dash-cam footage has been released to show the dangers of trying to overtake on rural roads. This Porsche driver almost caused a head-on collision as she overtook on a blind bend on her way to “pick her husband up from the pub”. The footage was captured by driver Damian Hodgson, who was amazed when the woman, at the wheel of a Porsche Cayenne, put her foot down to overtake on the dangerous corner. The dashcam footage shows the driver overtake Mr Hodgson and then a Citroen in front, before seeing an oncoming Skoda. The Skoda mounted the grass verge while the Porsche veered into the Citroen - leaving both damaged - before speeding away. Mr Hodgson, 35, said: “We were in complete shock. We couldn’t believe what we were seeing. 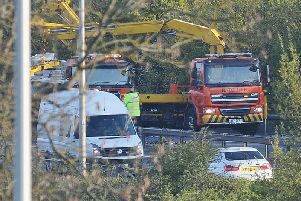 The drivers after the incident Mr Hodgson, who had five passengers including his wife and children, aged two and five, stopped to speak to the Skoda driver, whose car was unharmed. A girl aged around 10 in the front passenger seat was in tears. He continued on the road when he saw the Porsche and Citroen drivers pulled to the side of the road. Mr Hodgson said he stopped to see the elderly couple in the Citroen exchanging details with the Porsche driver. He said: “The Porsche driver told me she thought she was going to die. She was shaking like a leaf and on the edge of crying as she knew she had done wrong. The incident was the second Mr Hodgson has captured on his dashcam, after buying one 19 days ago following a crash on holiday in Florida. He said: “It so easily could have been us. It is just not worth even thinking about though. With the width of my seven seater, if we were in the position of the Citroen, there would have been nowhere for the Porsche to have gone and it could have been fatal. He said he offered the footage of the incident, on August 14 at 5.15pm, to the drivers of the Skoda and Citroen for evidence, but both declined.